Love a lush, green lawn? A lush green lawn is lovely to look at, but too much of a good thing can be bad. Often, that beautiful lawn is the result of regular fertilizing. An abundance of nitrogen and other nutrients in natural waterways can cause trouble for aquatic plant and animal life. High levels of nitrogen and phosphorus can cause an overgrowth of algae in the water, which then blocks light from getting to native aquatic plants. As algae dies and decomposes, it consumes dissolved oxygen in the water. When there is a lack of dissolved oxygen, it can be catastrophic to native plant and animal life. What causes an overabundance of nitrogen and other nutrients in waterways? First, when chemical fertilizers are over-applied or applied just prior to rain or watering, high levels of nitrogen and phosphorus can be washed into nearby waterways, rivers, and lakes resulting from runoff. Second, pet, livestock, and wildlife waste also contribute to high nutrient levels in waterways after rain events. 1. Use fertilizer only as directed. 2. Do not apply fertilizer prior to forecasted rain events. 3. Properly dispose of pet and livestock waste. 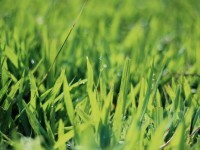 For more on environmentally sound lawn care, read All About That Grass! and Get reel!